Topics: Processes, Services, Materials, Parts Gallery, and Certification. Lunar Pages (California, Anaheim) is the location of the Apache/2 server. It has 2 DNS records, ns2.lunarpages.com, and ns1.lunarpages.com. 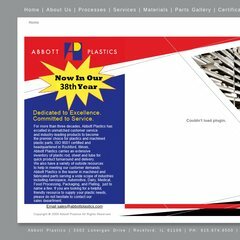 Abbottplastics.com's server IP number is 67.210.124.40. PING (67.210.124.40) 56(84) bytes of data. A time of 51.4 ms, is recorded in a ping test.